They Go on Mumbling. . . is for four classical guitars to which items are either attached directly to the strings or inserted in between the strings and the guitar in order to alter the usual sound of the guitar. 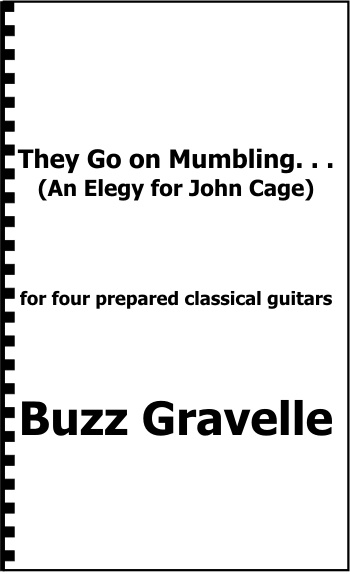 This is one of the first, if not the first, quartet of prepared guitar music ever published. Note that much care has been taken to ensure that none of the preparations are harmful in any way. Because many of the prepared sounds are soft, it is suggested to amplify performances taking place in large spaces. Note: the entire work is recorded on the Modern Arts Guitar Quartet CD/DVD.